After a couple of days temperatures rose again, the sun came out and the snow started to melt. It was time for Pomi and me to go back to the Mediterranean. ” Hmm.” Pomi looked at me pensively. ” I loved the Christmas market. And the food! So much candy! ” Why is that?” Pomi looked at me squinting his eyes. ” You do not need a ticket because…” I could not finish the sentence. ” I guess not.” Pomi looked at the telephone. I think he was sad. 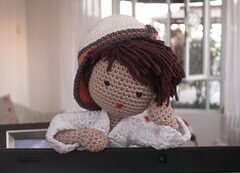 ” I shall call it a night,” my little crochet guy finally said, slipped under the covers and went to sleep. Heike, those snowy scenes are so enchanting. I love the photos of Pomi in the snow, of the golden light falling on the sweets in the shop window, and of Pomi ensconced in that lovely fluffy bed. Quite an adventure!! But I think he loves his terrace here, too, and the sunlight and snails and geckos and bougainvillia. I’m glad you’re both back safe and sound! Oh yes, Pomi loves the terrace! And the sunlight too! By the way, what is spit cake? An odd name for cake!! But since Pomi liked it, it must be something good. It is a cake that is baked on a spit. And yes that is a strange name for a cake. In German we say “Baumkuchen”. Ah, I see, that kind of spit!!! Is it like kiortush? Exactly, it is baked like ‘kiortosh’ but it tastes entirely differnent! Your stories get richer and richer. .Like the “Baumkuchen”? Have you ever had any? Baumkuchen I mean?